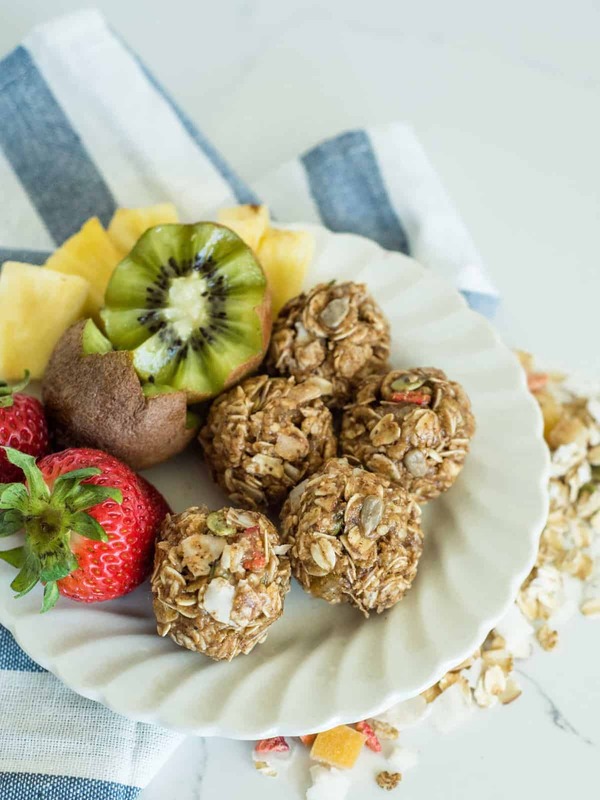 3 Ingredient No Bake Muesli Bites made with tropical muesli, almond butter, and honey that only take 1 minute to stir together. 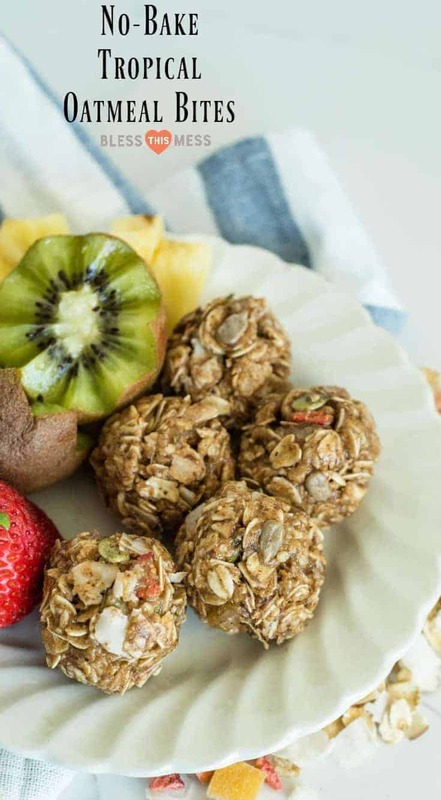 You all know how I feel about no bake oatmeal bites. 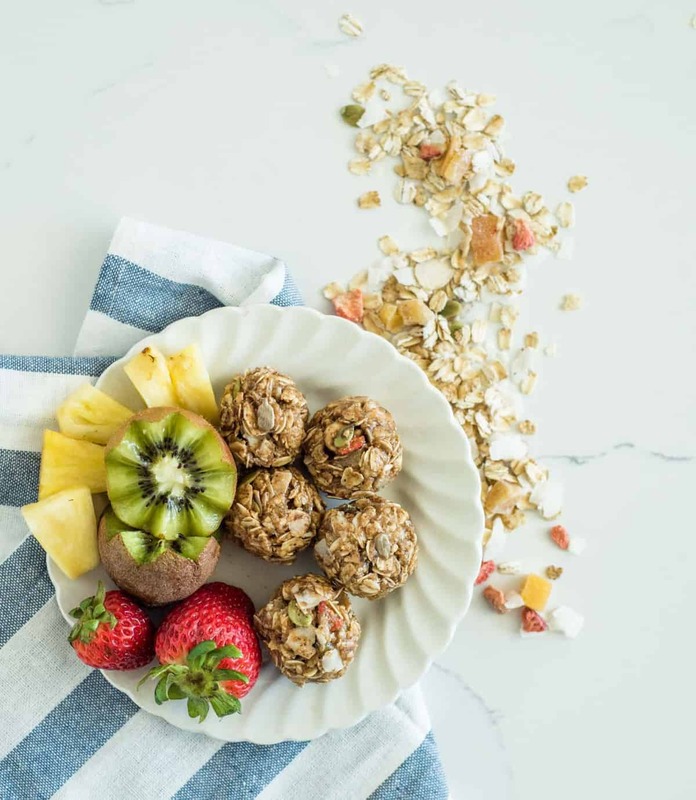 I have many recipes for them on Bless this Mess (including the super popular post with 8 No-Bake Oatmeal Energy Balls all in one place! ), and I make at least a batch of them every week at my house. 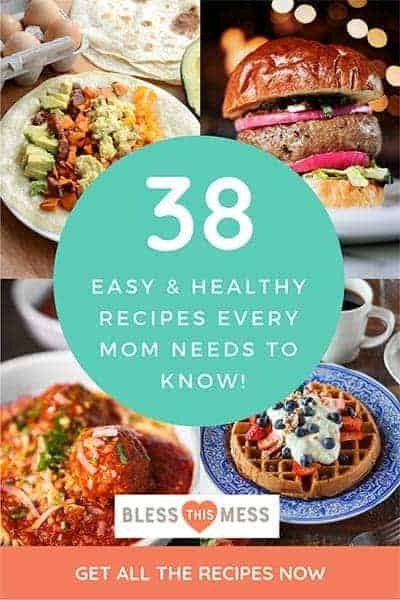 My kids love them, I love how easy they are to make, and I love that I always have everything on hand to make them. 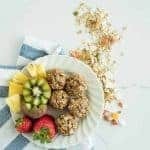 I also love that they taste like a cookie but have some great fat, complex carb, and fiber in them which means they are a great snack option for my busy family. 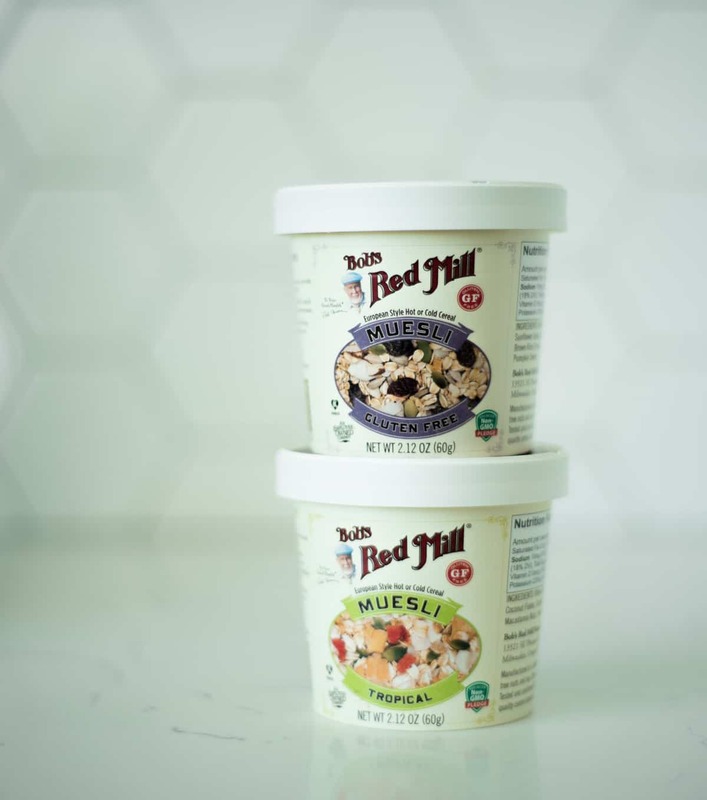 Today I’m working with Bob’s Red Mill to tell you about their new Muesli cups and I’m honored that they asked me to do this. I love and use many Bob’s Red Mill products in my kitchen, and I can’t wait to share this new one with you. What is Muesli and how do I eat it? Muesli is a breakfast or brunch dish that is made with a mixture of raw rolled oats and other ingredients like nuts, grains, seeds, coconut, spices, or dried fruit. It can be eaten hot or cold in so many ways. You can add hot water to it and eat it hot like oatmeal, you can add milk or nut milk and eat it like cold cereal, or you can add yogurt and grated apple and let it sit overnight to soften like overnight oats. We discovered it on a trip to Australia a few years ago and have been enjoying it at home ever since. I like to think of it as uncooked granola without the added sugar and oil. If we aren’t eating it hot or cold, we’ll just eat it raw like trail mix. My kids LOVE uncooked rolled oats. Seriously, they’ll grab the carton and just eat them straight. Keeping the Muesli and oatmeal cups from Bob’s Red Mill is one of my favorite time saving tips. 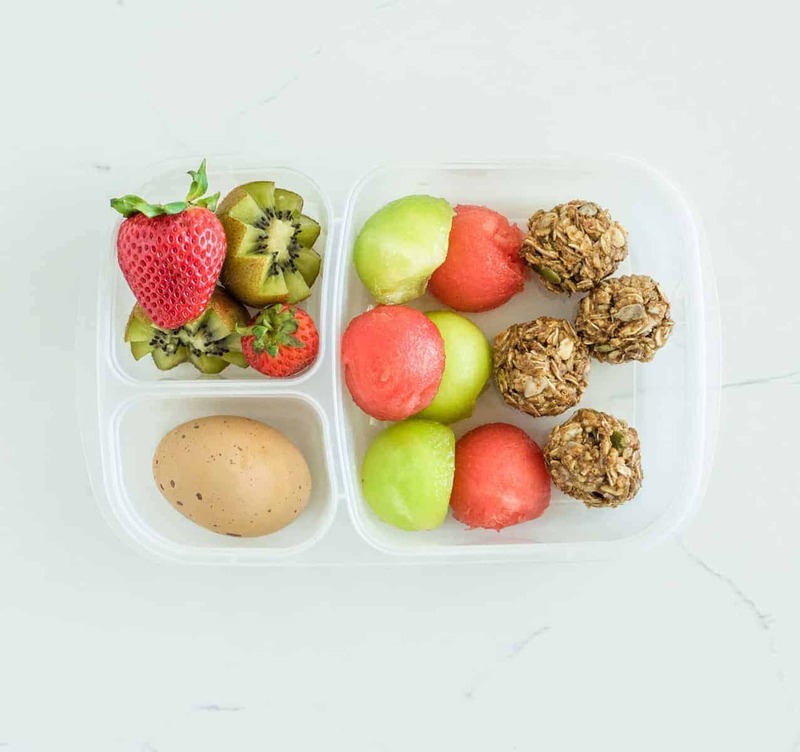 My kids can get them out themselves and add some milk, I can take them easily in my carry-on while traveling, and they’re perfect for on-the-go breakfast or snacks in the car. We love them. The chill time is literally the only thing that takes time with this recipe, but it’s a must. It gives the muesli bites time to soak up some of the moisture from the honey and helps them stick together. This recipes makes the perfect amount for a little snacking. If you’d like to make a larger batch, Bob’s Red Mill does sell larger 14-ounce bags of Muesli. I chose the Tropical Muesli cups to work with but you can use any of the Bob’s Red Mill Muesli varieties that you’d like. I just wouldn’t use the paleo version. It doesn’t contain oats, and the bites won’t stick together very well without them. I keep a batch in the fridge to pull out when the middle of the afternoon sugar monster hits. 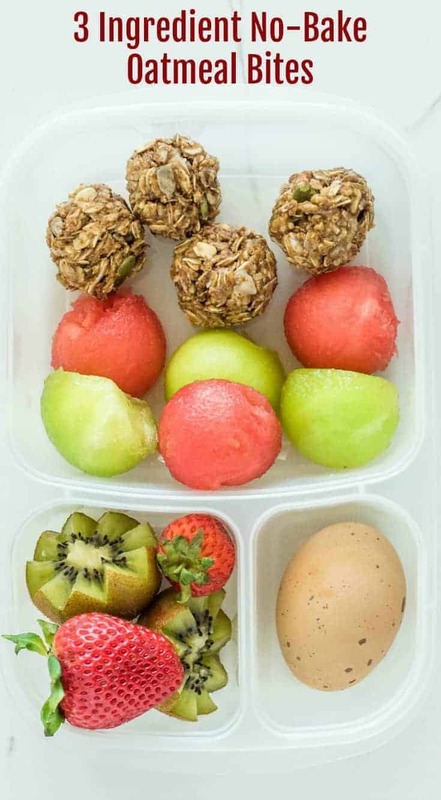 They makes a great packed lunch or breakfast combined with a boiled egg and some fruit. They are a great pre- or post-workout fuel snack. Like I said, healthy carbs, fats, and fiber are awesome. Open the cup of muesli and add the almond butter and honey (and any extras that you want, such as the cinnamon, salt, or vanilla). Stir well to combine. Place the muesli mixture in the fridge and let it chill for 10-20 minutes. After the mixture has chilled, roll it into balls and enjoy. How simple do those look?! And only three ingredients! Using muesli has its perks, friends, because all of the nuts, coconuts, and dried fruit are all ready to roll. Enjoy this super simple recipe from my kitchen to yours! Disclosure: This post was sponsored by Bob’s Red Mill and I’m so excited to be working with a brand that I love and use regularly in my kitchen. 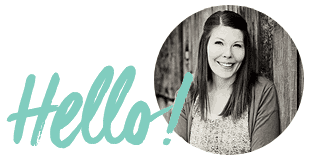 Thank you for supporting the brands that I thoughtfully choose to work with.